← Regency Gardens Nursing & Rehab Resident Celebrates a Milestone! Posted on March 8, 2013	by Judah Gutwein, L.N.H.A. So here I am, sitting in my office at the Regency Park nursing and rehab center, watching what the Meteorologists are projecting to be the last vestiges of winter’s fury, before things start warming up (I sure hope so). 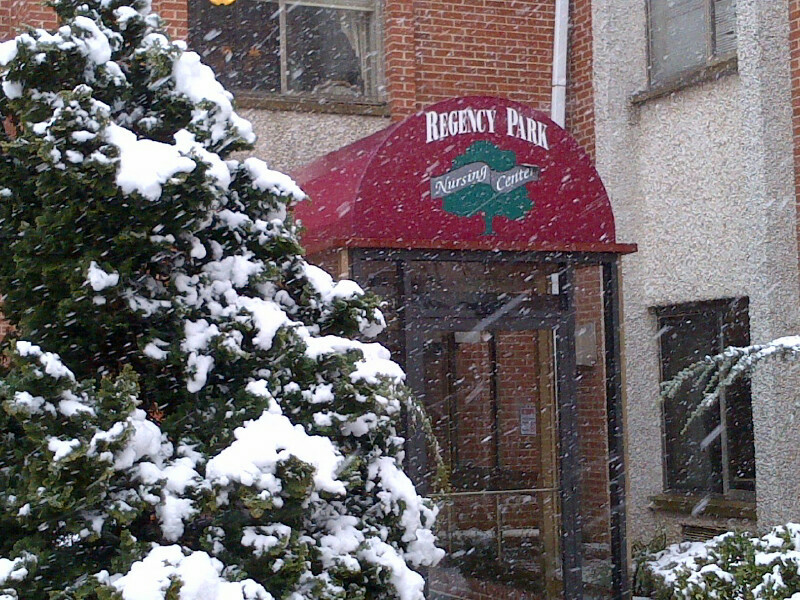 The truth of the matter is, there is a certain beauty and serenity about “old man winter” and our wonderful residents love to watch the snowflakes fall outside of their windows while they sip on hot chocolate! 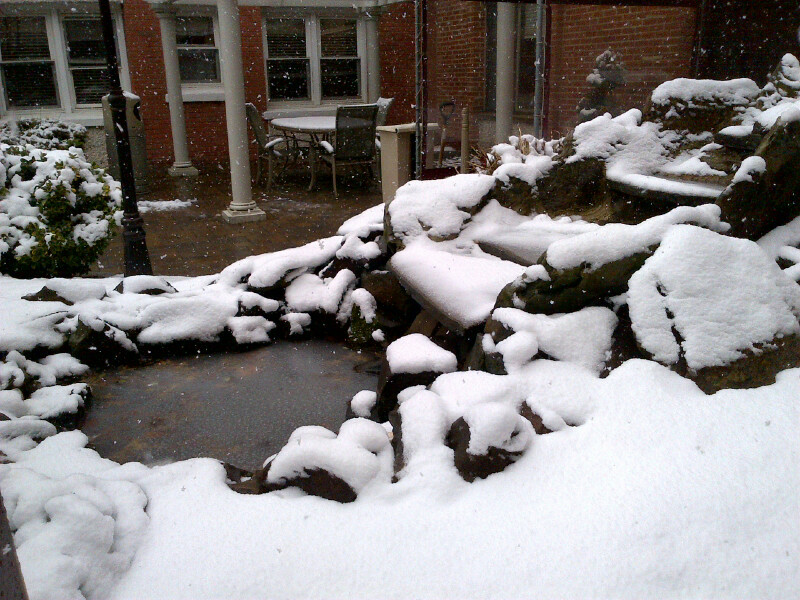 I just took these two pictures of our side door and one of our many beautiful waterfall and rock formations (currently, totally frozen over) with the snow white backdrop! Speaking of ‘snow and winter’, winter time is a period when it is of vital importance to protect our residents and senior citizens, who are more prone to sickness and infections during these brutally cold months. We have put together this tutorial to empower you with information on this subject! Tips for keeping yourself and elderly loved ones safe, secure and warm during the cold weather months. The winter months can be a difficult and dangerous time for anyone living in an area of the country where temperatures regularly fall below freezing. The frail and elderly are especially susceptible to winter hazards such as icy streets, exposure to cold and inadequate home heating. If you or someone you know is over age 65 or in some way disabled and living alone, it is important to safeguard against the most common causes of cold weather death and injury as outlined in this booklet. 1. Have your heating system checked annually for possible problems. If your furnace breaks down during a cold spell, temperatures in your home could plummet in a matter of hours. Keep in mind that during peak breakdown periods, generally between December and February, it may be days before repairs can be made. 2. Install smoke alarms and carbon monoxide detectors near bedrooms and on all floors of your home or apartment – MAKE SURE THEY’RE WORKING. Test them monthly and change their batteries at least once a year. In the event of a gas leak, faulty heater or winter fire, they could save your life! 3. Make sure you have plenty of warm blankets, candles and working flashlights on hand in case of a winter power outage that could leave you without heat or electricity. 4. Keep an emergency supply of canned goods and necessities in your home. A sudden winter storm could leave you unable to venture out to the store. You should have enough on hand to last several days. 5. Have a battery-powered portable radio available. This will allow you to obtain weather reports and other emergency news in the event of a power outage. In case power lines are disabled, it is also advisable to have a cell phone for emergency use. 6. Stock up on medications you may need and if you have a home health care service, plan ahead with the agency to establish emergency procedures. 7. Pre-arrange for someone to check on you in the event of a weather emergency. Falling is one of the biggest health hazards seniors face in the winter due to icy buildup on steps or walkways. When venturing out on freezing days, make sure to wear sturdy, low-heeled shoes with non-skid rubber soles. Although heavy, thick-soled shoes are often recommended for walking in snow, seniors with poor circulation may actually have better traction with thin-soled shoes because they provide better contact with the ground. Following a winter snowfall, stay clear of un-shoveled side-walks and hilly terrain. If you’re unsure of whether or not a sidewalk is slippery, proceed cautiously, walking with toes pointed outward, taking short, flat steps. Remove shoes immediately upon entering your home to avoid indoor falls caused by slippery soles. People over age 65, especially those with a history of high blood pressure or heart disease, should avoid the strain of shoveling snow whenever possible. The risks of severe muscle strains, falls or even heart attacks are simply too great. • Dress warmly! Wear layers, gloves and a hat to retain body heat and protect against hypothermia. • Do some light warm-up exercises to limber up before starting to shovel. • If possible, push the snow in front of you rather than lifting it. If you must lift it, pick up small amounts and lift with your legs, not your back. • Rest frequently and take lots of breaks. If you get dizzy or numb, go inside immediately. • Protect against slipping by using rock salt or de-icing compounds thoroughly on walkways and steps. Keep a supply near your front door. • When using a snow blower, be sure to read all the directions and follow the safety guidelines. • Keep clothing, curtains and blankets away from space heaters. • Never smoke in bed or when you’re drowsy. • Never use kerosene heaters or stoves to heat your home. • Make sure all smoke alarms and carbon monoxide detectors are in working order throughout your home. • Offer your phone number for emergency calls and check on elderly loved ones and friends regularly to make sure they’re safe. • If possible, arrange for someone to shovel and de-ice their walkways and steps. • During severe weather, see if they need transportation to and from medical appointments or to the grocery store. • Make sure they have emergency supplies on hand. • If loved ones are cognitively or physically disabled, arrange for someone to stay with them during a weather emergency. Hypothermia is classified as a drop in body temperature below 96 degrees and can be extremely dangerous if not detected early. Medical experts believe certain conditions such as stroke, severe arthritis and Parkinson’s disease can block the body’s response to cold, as can some medications. This makes seniors particularly susceptible to accidental hypothermia. Remember, even mildly cool temperatures of 60-65 degrees can cause a dangerous drop in internal body temperature, which can be deadly if not treated promptly and properly. • Try to limit your time outdoors, especially if you are in a high-risk group. • If you are forced to be outside during cold weather, wear warm, layered clothing made of natural fibers. You should wear a hat, warm socks and gloves to reduce heat loss. • Stay indoors on windy days. Even if the temperature appears to be moderate, wind chill can substantially increase your risk of hypothermia. • When indoors, keep your thermostat set at a comfortable level. Wear warm clothing, and use enough blankets at night to keep warm while sleeping. • Choose hot, nourishing meals and drink warm beverages to keep your body temperature up. If you suspect someone may be suffering from hypothermia, keep the person dry and warm with blankets. DO NOT rub limbs to warm them. You should also encourage them to drink hot beverages that are free of caffeine or alcohol. Above all, seek medical attention immediately. This entry was posted in HealthCare News, Senior Care and tagged how to stay safe in winter, keeping seniors safe, older people and winter, safety tips, safety tips for seniors, senior safety, seniors and winter, staying safe during the winter, winter advisories, winter safety for seniors, winter safety tips. Bookmark the permalink.